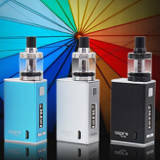 Free Delivery and Discounts on e-cigarettes, e-liquid and kits at ROK Electronic Cigarettes. Free standard delivery on all orders over £50 on a 2-4 business day service excluding bank holidays. With free UK delivery on orders over £50. ROK Electronic Cigarettes help users enjoy the benefit of smoking without the harmful chemicals that come with regular cigarettes. They can be enjoyed in public places without the usual stigma and no smell. New users can buy a starter kit that includes everything needed to get started and take advantage of a low cost smoking alternative. When you first visit VapeROK, you will get a pop up. This is important because the site wants to make sure you are over 18. Once you get to the site, at first glance you can see everything that is available. The main menu makes it extremely easy to navigate around the site and find exactly what you could possible need, whether it’s e-cigarettes, liquids, and batteries for your vapers. From the menu, VapeROK makes a point of letting you know about the free delivery options and next day delivery possibility. You’ll also find out about the reward points when you start buying through the site, making you want to come back for more. That’s when you can start looking at the rest of the site, which is full of images and videos to help you find just what you need. There’s even a section for the holiday season in case you want to buy for someone else. Getting in touch with a human takes a couple of seconds to find. It is at the very bottom, but there’s also a second menu at the very top of the site above the logo. This is also where you can find the blog to get tips on vaping and more.